When Al Zere (the working name of Alfred Alblitzer) came back from service in World War I, he was welcomed back with open arms to the Brooklyn Eagle, and his long-running comic strip Buttons & Fatty. However, I get the feeling that Zere wanted to make a bigger splash than he could there, and he left the strip to other hands at the end of 1920. I lose track of him for a few years, but in 1923 he pops up in the Hearst camp at their King Features Syndicate label (not their most prestigious at the time). Zere couldn't hit much more of the big-time than with Hearst. Unfortunately, the feature that was to pave his road to fame and riches was a rather dreary me-too strip about the tribulations of married life called, with no hint of originality, So This is Married Life. 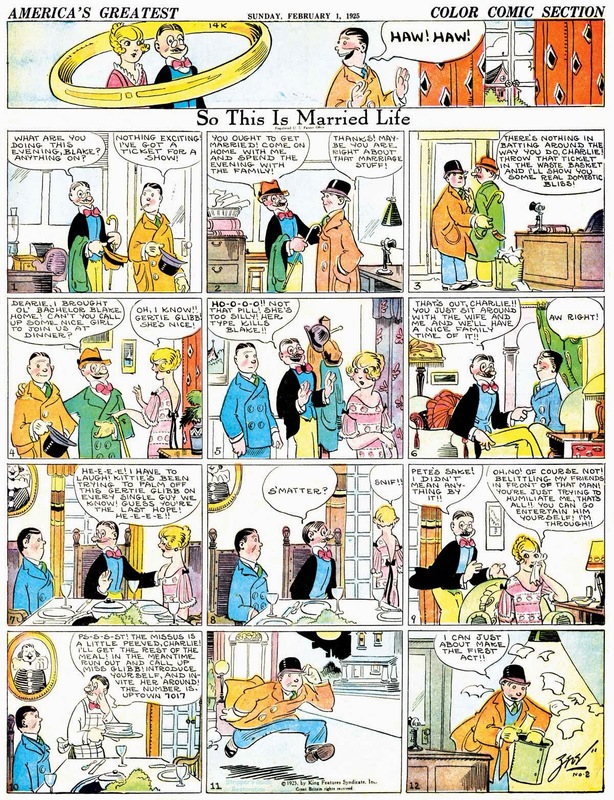 Why King Features wanted yet another of these 'marriage is hell' strips is beyond me, because there were plenty on the market already. But so be it. Zere dutifully produced a strip that read pretty much like all the others, with very little that I've seen to recommend it. The cartooning was good, but that's about all it had going for it. 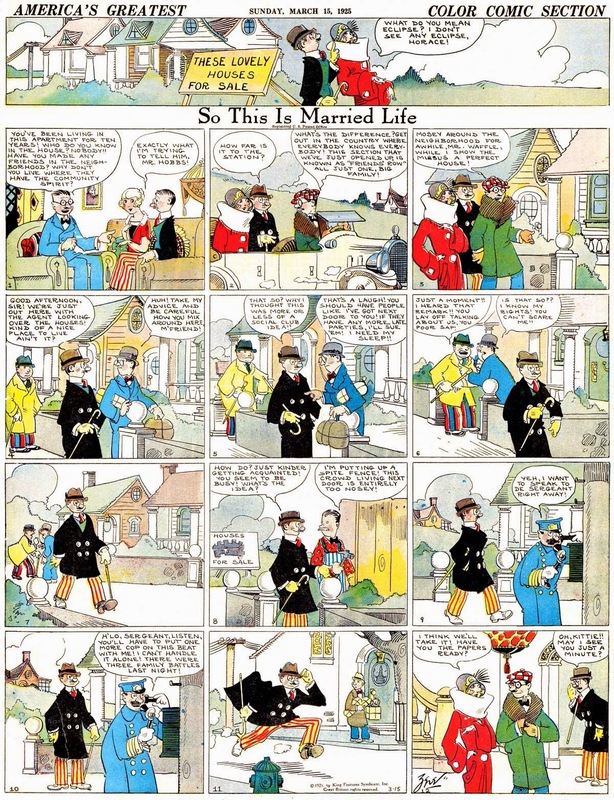 So This is Married Life debuted on January 15 1923 as a daily strip*. The Sunday version, which was added two years later on January 25 1925, is a real rarity which hardly seemed to make it into Hearst's own papers, let along paying clients outside of the Hearst system. I suspect it may have been produced on spec by Zere and King ran the strips just to fill a temporary hole. The Sunday didn't last long (I've never seen any past March 1925), but the daily persevered. It seems to have finally gotten its final divorce decree from newsprint on March 24 1928. Unfortunately, this turned out to be Zere's one serious shot at the big time. Although he would continue in newspaper cartooning into the 1940s, he never had a feature that was much more than a minor blip on the radar. * Note: Ohio State University's online catalog indicates that they have dailies as early as December 27 1922. So the strip may have started earlier. But without a newspaper title in the OSU reference I have no way to cross-check their data. My start date is based on the Chicago Evening American. Love Zere's drawing style and the coloring too, which was probably the syndicate doing that.